The legislative act of 27 Feb. 1877 that established the North Carolina Department of Agriculture (NCDA) and a Board of Agriculture also created the North Carolina Agricultural Experiment Station, the first such station in the South and the second in the nation (Connecticut's station began in 1875). The station began work on 19 Apr. 1877 in a one-room chemistry laboratory at the University of North Carolina in Chapel Hill. In the summer of 1881 it was transferred to the old State Agricultural Building in Raleigh. The original legislation directed the experiment station to conduct research on plant nutrition and growth, to ascertain which fertilizers were best suited to specific crops, and to conduct other needed investigations. The initial movement to establish field testing stations began in 1885, when the General Assembly directed the Board of Agriculture to secure prices on lands and machinery. The board obtained 35 acres on Hillsborough Street in Raleigh, and the job of clearing land, laying out test plots, and constructing buildings began. On 8 Sept. 1889 management of the station was formally transferred to the North Carolina College of Agriculture and Mechanic Arts (precursor to modern-day North Carolina State University). The federal Hatch Act (1887), which had provided $15,000 to each state for agricultural research, had specified that the money be directed to land grant colleges. In establishing the College of Agriculture and Mechanic Arts, the legislature had provided that it would receive all land grant benefits. While the NCDA maintained its relationship with the agricultural experiment station, it shifted its effort to establishing other stations, or "test farms," in various locations statewide. The purpose was to experiment with different crop-fertilizer-soil combinations to find the most suitable for certain areas. The first two research stations were in Edgecombe and Robeson Counties. In all, 15 stations were opened-in locations including Whiteville, Clayton, Castle Hayne, Clinton, Kinston, Oxford, Salisbury, Plymouth, Laurel Springs, and Reidsville-and the NCDA began to conduct research on farming practices, livestock, poultry, and crops at these sites. The NCDA and N.C. State University continue to operate these experiment stations cooperatively. The NCDA owns nine stations and provides administrative support. N.C. State owns the other six and provides scientists for various research projects. The Center for Environmental Farming Systems at Cherry Farm in Goldsboro, dedicated in February 1994, studies organic, no-till optimized yields and sustainable agriculture. 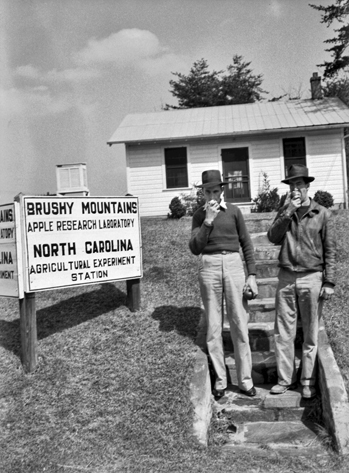 A Century of Service: The North Carolina Agricultural Experiment Station at Raleigh (1979). Annual Report of the North Carolina Agricultural Experiment Station. http://digital.ncdcr.gov/u?/p249901coll22,453172. North Carolina Department of Agriculture and Consumer Services. "NCDA&CS Research Stations." http://www.ncagr.gov/research/ (accessed May 22, 2012).